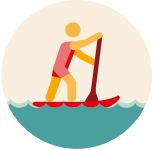 Stand up and paddle! It’s the world's fastest growing watersport, and we understand why. Our flat waters make for the best SUP conditions. Whether you are just beginning, and need some time practicing balance and coordination, or you've got the hang of it and are up for some exploring - it’s fun for everyone! For beginners we advise staying in the designated swimming areas, where the shallow waters allow for easy practice. You may fall a few times, but it’s part of the fun. For the more adventurous, a sea safari is always a fun choice. Take the boards to the reef, and try spotting some flying fish or even turtles. - But remember to leave yourself enough energy to get back! Got a need for speed? Then our race board is the choice for you. Get maximum exercise as you speed across the water. 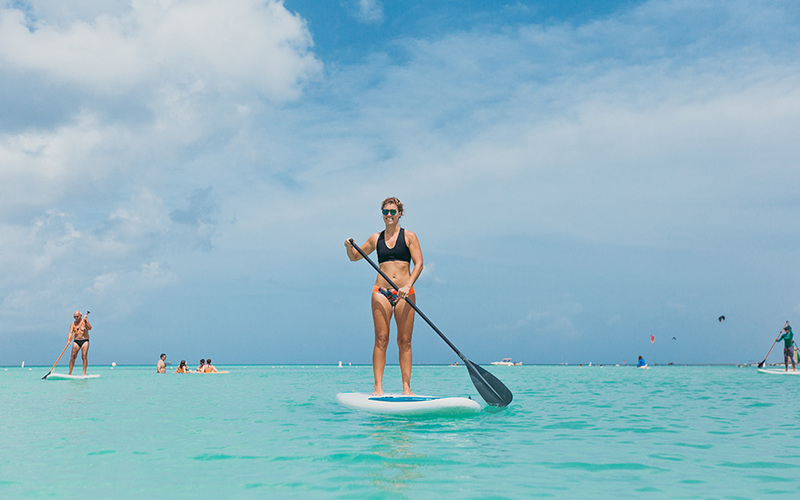 Paddleboarding is an excellent group activity, but also serves as a great way to get out on the ocean alone for some much deserved me-time! This price is based on 1 hour Stand Up Paddling. This price is based on 2 hours Stand Up Paddling.